The facial nerve, also known as the seventh cranial nerve or cranial nerve VII, is used to control facial expressions. It splits into five branches: cervical, mandibular, buccal, zygomatic and temporal. These branches spread across the face and work together to make facial expressions. They also are used for speech, chewing and other basic facial functions. Additionally, the facial nerve is responsible for taste in the front two thirds of the tongue and mouth. Babak Azizzadeh, MD, FACS is internationally recognized for his expertise in facial plastic surgery and complex facial nerve reconstruction procedures. His Harvard-trained expertise in aesthetic and reconstructive facial nerve surgery attracts patients both nationally and internationally to the CENTER for Advanced Facial Plastic Surgery, including those who require complex facial nerve treatments. Dr. Babak Azizzadeh is the only facial nerve expert to have been featured on The Oprah Winfrey Show and The Dr. Oz Show. Learn more about facial paralysis at The Facial Paralysis Institute. Facial paralysis occurs when one or more branches of the facial nerve stops functioning properly. Facial paralysis makes it difficult for a person to make facial expressions and hinders this individual’s ability to chew, swallow and speak. There are many causes of facial paralysis, and determining the root cause of an individual’s facial paralysis plays a key role in finding the right facial paralysis treatment. 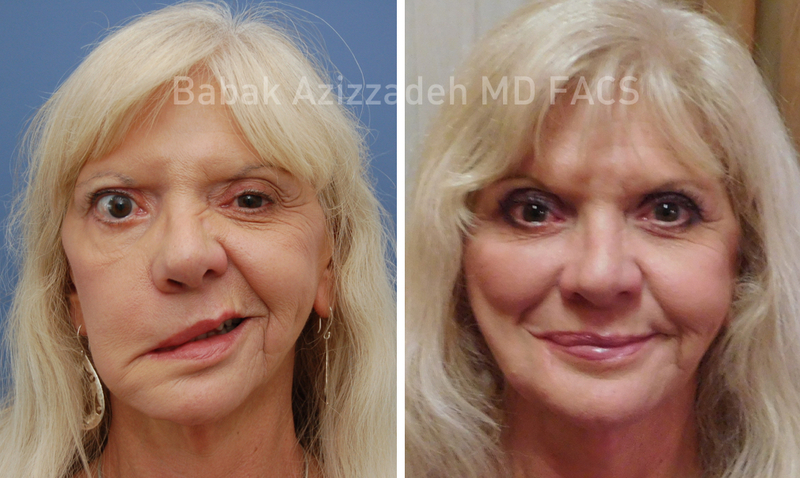 As a foremost expert in facial nerve reconstruction, Dr. Azizzadeh has led the facial paralysis field and developed techniques to help patients reanimate their facial features. Dr. Azizzadeh is board-certified in facial plastic and reconstructive surgery, along with otolaryngology (head and neck surgery). He also is well-versed in virtually every aspect of cranial anatomy, including the critical facial nerve. Much of Dr. Azizzadeh’s career has been spent researching and developing techniques to restore facial nerve function for those who have lost it to congenital deficiencies or trauma. As the Director of the Facial Paralysis Institute, Dr. Azizzadeh is recognized worldwide as a leading figure in the field of facial nerve paralysis. After demonstrating incredible proficiency during his residency, Dr. Azizzadeh was selected to complete a highly focused, sub-specialized fellowship in facial plastic and reconstructive surgery at Harvard Medical School. It was during this time that he began his crucial work to find quick, efficient and safe ways to correct facial paralysis. Since that time, Dr. Azizzadeh has helped hundreds of patients with facial paralysis and demonstrates what is now possible in facial nerve reconstruction. There is no surefire cause associated with facial paralysis. Instead, facial paralysis is caused by any condition that damages the facial nerve. When facial nerve damage occurs, facial features innervated by the facial nerve become partially or completely dysfunctional. In treating facial paralysis, Dr. Azizzadeh’s expertise allows for accurate diagnosis. He dedicates time and resources to learn about patients and their facial paralysis symptoms. Dr. Azizzadeh’s holistic approach to facial paralysis is crucial for effective treatment and enables him to provide a personalized treatment to each facial paralysis patient. Facial paralysis symptoms vary from patient to patient. While most patients will know they have some degree of facial paralysis, there are some who have subtle symptoms. Regardless of the type or degree of symptom, it is imperative that such patients seek the help of a facial nerve specialist to discover their treatment options. If you or someone you know has one or more of the above symptoms, it is time to seek the care of a facial nerve specialist. As an internationally renowned expert in the facial nerve and treating facial paralysis, Dr. Azizzadeh is regularly sought by both patients and peers from around the world. He helps his patients understand their condition and offers a partial or total solution to address their facial paralysis symptoms. In many cases, he will offer innovative and comprehensive reconstruction techniques that other surgeons cannot provide. A comprehensive facial nerve consultation with Dr. Azizzadeh is a unique experience. After examining a patient’s face and learning about this individual’s concerns and goals, Dr. Azizzadeh will discuss both non-invasive and surgical approaches. As a world-renowned, double board-certified facial plastic and reconstructive surgeon, Dr. Azizzadeh customizes surgical and non-surgical treatments to address facial paralysis symptoms. As a result, his patients can reap the benefits of a symmetrical, natural-looking facial appearance, as well as make facial expressions and chew, speak, swallow and perform other basic facial functions without any problems. While some patients can benefit from non-invasive procedures alone, others will need surgery to reconstruct the facial nerve and restore facial function. Dr. Azizzadeh will determine which surgical options will best benefit each patient by listening to the patient’s personal cosmetic and functional goals. He also examines the patient for underlying issues and strives to identify the root cause of each patient’s facial paralysis symptoms. In many cases, the ideal facial paralysis treatment includes both surgical and non-surgical options. As a highly specialized facial plastic and reconstructive surgeon, Dr. Azizzadeh takes plenty of time to help his patients understand their facial paralysis treatment options. He educates patients about the underlying causes of their facial paralysis, along with how each treatment option will address those particular issues. In the complex field of facial nerve reconstructive surgery, knowledge is the most important thing for a patient, and Dr. Azizzadeh’s primary goal is to teach patients everything they need to know about the facial nerve. That way, patients understand exactly what to expect from a facial paralysis treatment, and Dr. Azizzadeh and a patient can work together to help this individual achieve the best-possible treatment outcome. Am I A Good Candidate for Facial Nerve? With facial paralysis surgery, Dr. Azizzadeh assembles a team of world-class otolaryngologists, ophthalmologists and physical therapists to help patients through every aspect of treatment and recovery. From beginning to end of facial paralysis surgery, patients can rest assured they are in the hands of a dynamic, integrated team of individual experts. There are many different facial paralysis surgery options. Facial paralysis is a constantly evolving field, and Dr. Azizzadeh explores innovative approaches to help patients relieve their facial paralysis symptoms. As an internationally renowned facial plastic and reconstructive surgeon, Dr. Azizzadeh has been featured in major news outlets for his unrelenting expertise in this crucial field. Most notably, he was featured on Oprah for his groundbreaking facial nerve reconstruction on Mary Jo Buttafuoco, a prominent victim of a shooting. His expertise has also been featured on The Doctor Oz Show and Inside Edition, as well as in People Magazine and The New York Post. Finding the right facial nerve treatment may seem virtually impossible at times. Fortunately, Dr. Azizzadeh is available to help patients discover the best ways to overcome facial paralysis symptoms. To find out more about how Dr. Azizzadeh helps patients treat facial paralysis, please contact us today at 310-657-2203 to schedule a consultation at the CENTER for Advanced Facial Plastic Surgery in Beverly Hills.